The 3000K tungsten Flolight FL-110AWT Fluorescent Video Light with Wireless Dimming is a great choice for a studio fixture when high output, low running cost, and soft light are priorities. The FL-110AWT uses two 55W fluorescent lamps to give you an impressive 500W hotlight equivalent. That's impressive enough, but it does it with minimal heat and a low power draw of only 106.2W. That means that you won't toast the talent while saving money both on kilowatt usage of the fixture and on AC costs that would have been needed when the hotlights you used turned your studio into a sauna. And with a lamp life of about 8000 hours the FL-110AWT is practically maintenance free. In situations where low light is required the built in 30-100% dimmer allows you to reduce power either on the unit's side panel or with the included wireless remote control. Beam control is provided by the built-in 4-way barndoors and the included diffusion cloth. The fixture comes with 2 lamps and 2 yokes to offer you a choice of vertical or horizontal mounting. Fluorescents give naturally soft, even light. The included slide-in diffuser provides an even softer light. 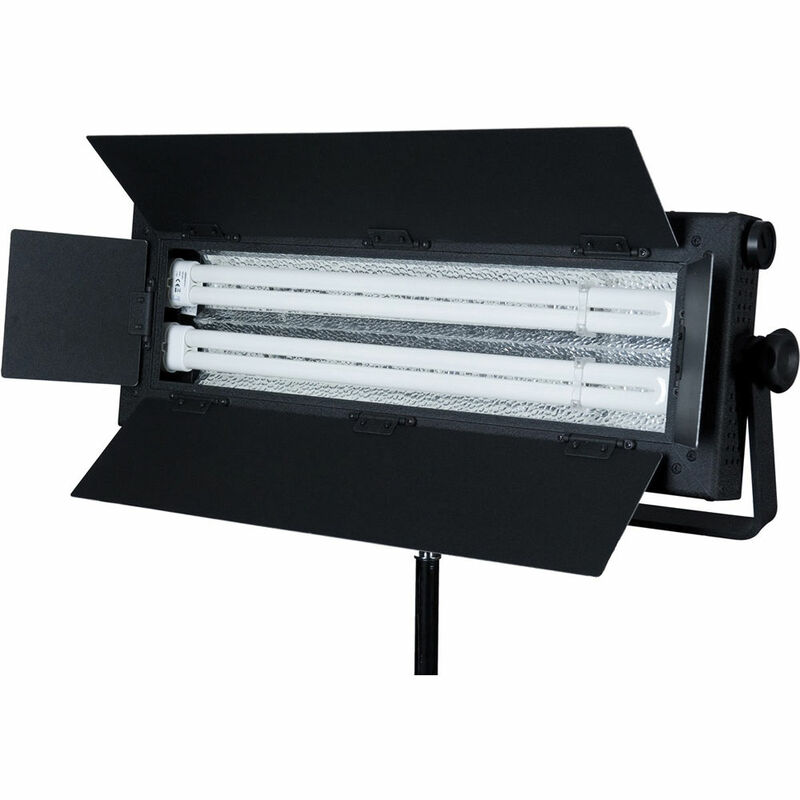 The FL-110AWT is perfect for studio or location work where power hungry incandescents can quickly overload available power. With just a fraction of the heat of incandescents you also avoid cooking your talent or constantly running air conditioning. The FL-110AWT utilizes two 55W Biax lamps. Box Dimensions (LxWxH) 28.7 x 13.0 x 6.1"
FL-110AWT Fluorescent Video Light with Wireless Dimming (3000K Tungsten) is rated 4.0 out of 5 by 1. Rated 4 out of 5 by George from Great light for the price Very good answer to higher priced fluorescents. The remote control dimmer for up to 4 lights is a great features.